Mutant has done it once again with another groundbreaking addition to its lineup. The new ZM8+ is more than an ordinary ZMA product! The new ZM8+ features 8 essential nutrients needed for deep sleep, recovery and optimal hormonal activity. 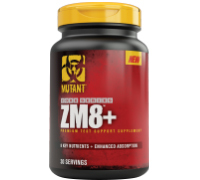 Alongside the standard blend of zinc, magnesium and B6, found in any ZMA formula, ZM8+ features a unique blend of Vitamin D3, B12, Selenium, Manganese & Chromium. These added ingredients feature an impressive array of benefits which include supporting immune function, weight management, improving testosterone levels & enhancing muscular recovery! With proven levels of zinc, magnesium & B6 plus 5 additional ingredients, ZM8+ is sure to have you sleeping better and waking up feeling more refreshed than ever! 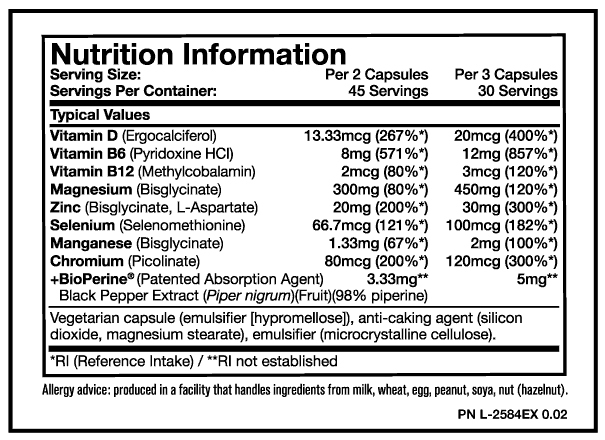 On training and non-training days, take 2-3 capsules at night before bed on an empty stomach with 250 mL of water. Use for 8 weeks followed by a 4 week off-cycle.